The report points to the fragility of satellite positioning signals which can be affected by cheap jammers, spoofers, weather and interference from other radio signals — among other vulnerabilities. The 86-page PDF document is downloadable here. The review incorporates the results of a separate but related study, issued in April 2017, looking at the fiscal consequences of a GNSS disruption in. “Economic Impact to the U.K. of a Disruption in GNSS” was briefly summarized in a June 2017 column from this magazine (scroll down to “At What Cost Ignorance?”). The report attempted to quantify the cost of a GNSS disruption, should one occur. The authors came up a figure of 5.2 billion pounds ($6 billion) for a 5-day disruption. David Last, a UK consultant engineer specializing in radio navigation and communications systems, professor emeritus at the University of Bangor, Wales and past president of the Royal Institute of Navigation, consulted on the June 2017 economic impact report, and was a member of the expert panel and co-author of the January 2018 Blackett Report. He was to have given a presentation on them at the ION International Technical Meeting in Reston, Virginia on January, but could not make the trip. The following materials are drawn from his prepared presentation. 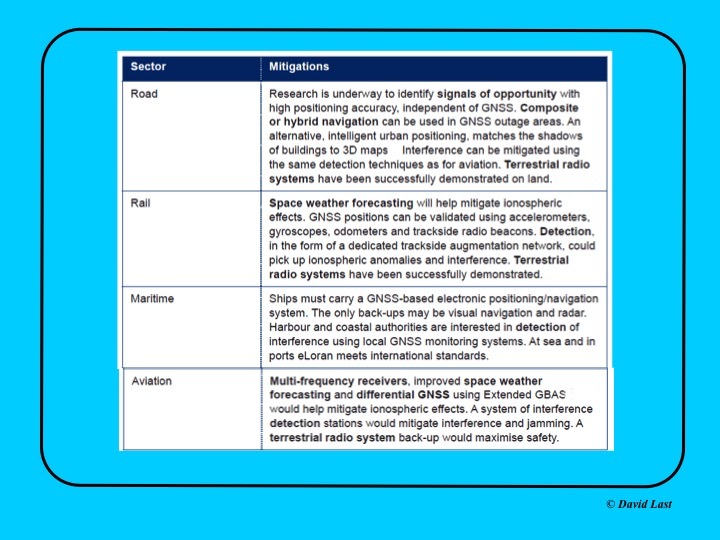 From the just-issued Blackett Report, the first figure displayed above presents recommended mitigations to impacts on GNSS applications in road, rail, maritime and aviation. Alternative options include composite or hybrid navigation, terrestrial radio systems, space weather forecasting, eLoran, various methods of interference detection, multi-frequency receivers and differential GNSS. 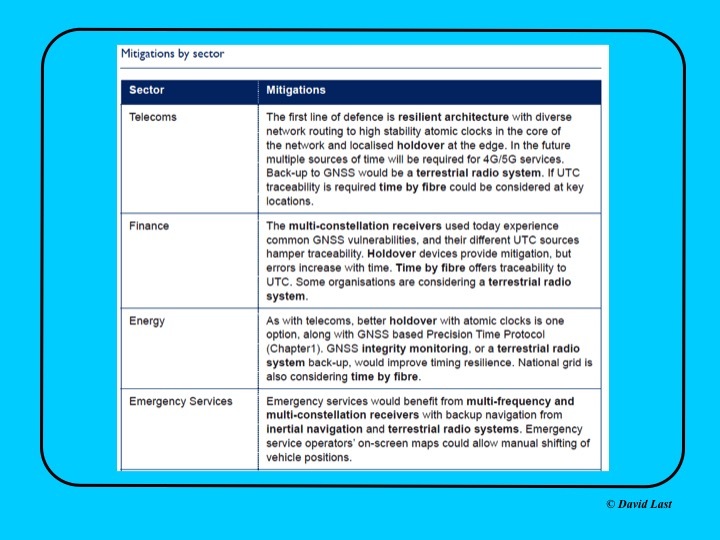 A second figure from Last’s presentation, shown above, covers the mitigations recommended for telecoms, finance, energy, and emergency services sectors. 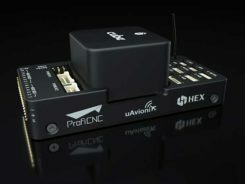 Mitigations for these applications include a resilient architecture with diverse network routing to high-stability atomic clocks, terrestrial radio systems, time-by-fiberoptics, multiconstellation receivers, holdover devices, GNSS integrity monitoring, and inertial navigation. CNI operators to review and report on their reliance on GNSS. Cabinet Office to assess overall dependence of CNI on GNSS. Add loss or compromise of GNSS-derived PNT to National Risk Assessment, not just as a dimension of space weather. 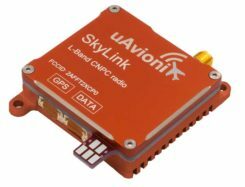 In allocating radio spectrum to new services and applications, address the risk of interference to GNSS-dependent users, including CNI. Review the legality of the sale, ownership and use of devices and software to cause deliberate interference to GNSS receivers or signals. Cross-government PNT Working Group to report to Cabinet Office on ways to improve national resilience. Government to facilitate as those procuring GNSS equipment for CNI specify performance standards. Map PNT testing facilities and explore how industry and critical services can better access them. Leverage UK academic and industrial expertise in time and geo-location, increasing coordination among existing centres of excellence.